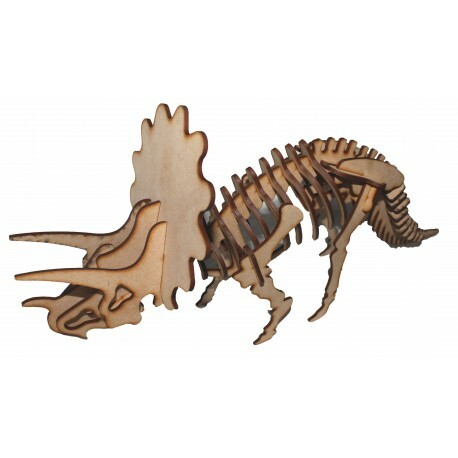 This Triceratops 3D Puzzle is recommended for children of 5 years and older. Triceratops (/traɪˈsɛrətɒps/ try-SERR-ə-tops) is a genus of herbivorous ceratopsid dinosaur that lived during the late Maastrichtian stage of the Late Cretaceous Period, around 68 to 65.5 million years ago (Mya) in what is now North America. It was one of the last non-avian dinosaur genera to appear before the Cretaceous–Paleogene extinction event. The term Triceratops, which literally means "three-horned face", is derived from the Greek τρί- (tri-) meaning "three", κέρας (kéras) meaning "horn", and ὤψ (ops) meaning "face". Bearing a large bony frill and three horns on its large four-legged body, and conjuring similarities with the modern rhinoceros, Triceratops is one of the most recognizable of all dinosaurs and the best known ceratopsid. It shared the landscape with and was preyed upon by the fearsome Tyrannosaurus, though it is less certain that the two did battle in the manner often depicted in traditional museum displays and popular images. The exact placement of the Triceratops genus within the ceratopsid group has been debated by paleontologists. Two species, T. horridus and T. prorsus, are considered valid although many other species have been named. Research published on 2012 suggests that the contemporaneous Torosaurus, a ceratopsid long regarded as a separate genus, represents Triceratops in its mature form, and not accepted by everyone. A study published on 2012 by Daniel Field and Nicholas Longrich, researchers from Yale, would later disagree with this assertion upholding that the two should be classified as separate species. Triceratops has been documented by numerous remains collected since the genus was first described in 1889, including at least one complete individual skeleton. Paleontologist John Scannella observed: "It is hard to walk out into the Hell Creek Formation and not stumble upon a Triceratops weathering out of a hillside." Forty-seven complete or partial skulls were discovered in just that area during the decade 2000–2010. Specimens representing life stages from hatchling to adult have been found.